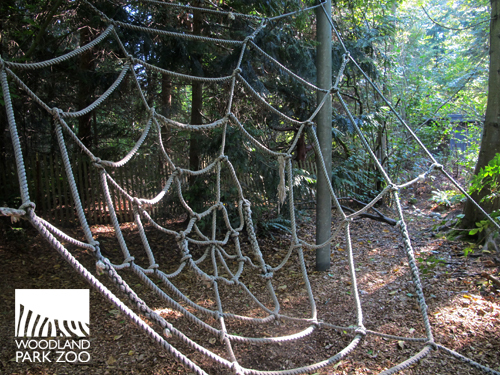 Woodland Park Zoo Blog: Do the spider dance! Fall is here! 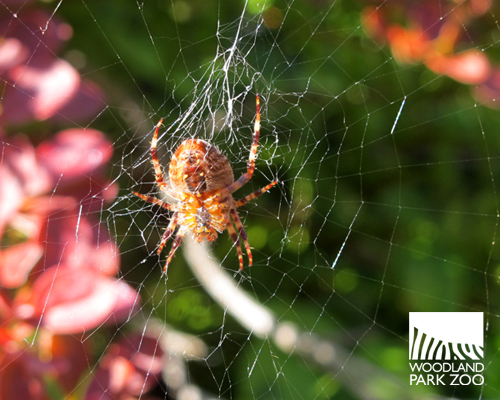 Crispy leaves, football, presidential debates, pumpkin spice lattes and… spidies! This orb weaver is decorating for fall! Photo by Kirsten Pisto/Woodland Park Zoo. 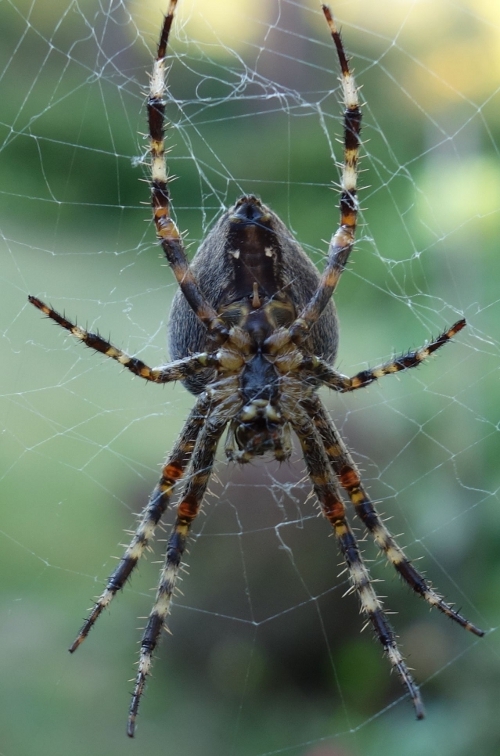 Spider webs appear everywhere; draped across your porch, athwart your front door, and if you happen to be tall, most likely dangling in your hair. Despite the unpleasantness of being greeted each morning with a silky web stuck to your face, orb weaver spiders are pretty incredible. 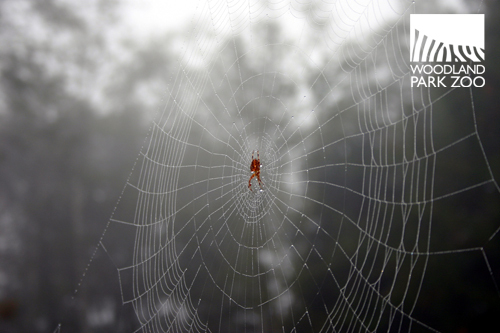 Dancing in the morning fog, an orb weaver constructs her web. Woodland Park Zoo archive photo. There are more than 3,000 different species of orb weavers around the world, but the most common species in Western Washington is the cross spider (Araneus diadematus). These tiny architects are unbelievable weavers. A female spider suns herself in the middle of her web. Photo by Kirsten Pisto/Woodland Park Zoo. Orb weavers construct their webs by first flinging themselves into the breeze. Attached to an anchor point, the spiders float through the air until they find a secure spot to dock. After the main line is attached, they drop a second line from the center, forming a “Y” shape. This is the foundation for the rest of the web. You can see why the pattern on this cross spider earns its name. Photo by Ryan Hawk/Woodland Park Zoo. The spiders then begin to weave radii along a spiral path with non-sticky silk. When they are done with the framework, the spiders will add a sticky, capture silk to the radii over the dry web. So, the only parts of the web that are sticky are on the radial web. A dew-dropped beauty! Woodland Park Zoo archive photo. Detailed view of a female cross spider’s legs, you can see the tiny setae hairs if you look close. Photo by a brave Ryan Hawk/Woodland Park Zoo. 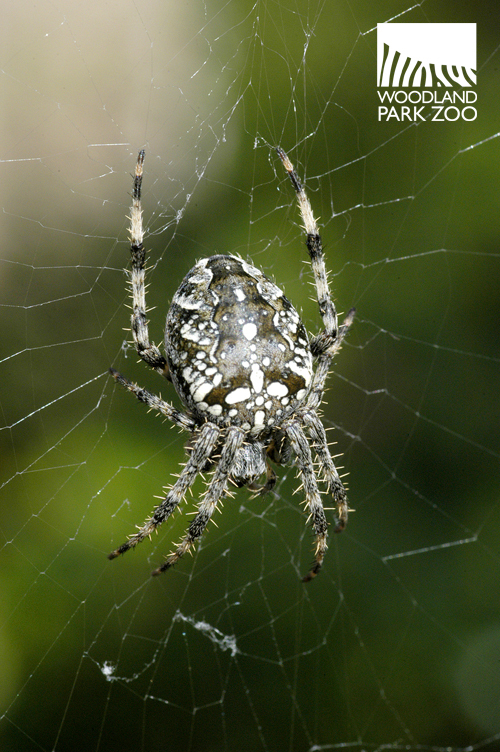 Orb weavers usually sit at the center of the vertical web, with their head facing down. 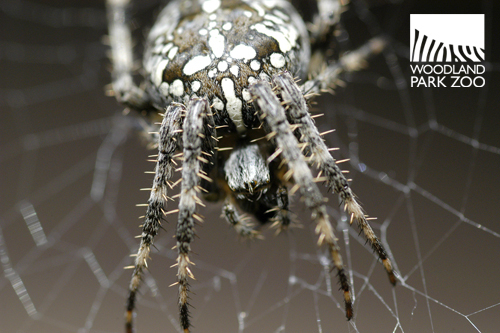 They can feel the vibrations throughout the signal line, so if an insect lands in a far corner of the web, the spider knows right where to run first. Orb weavers can decipher the vibrations of a falling leaf from the vibration of a flying insect, so they don’t waste energy. 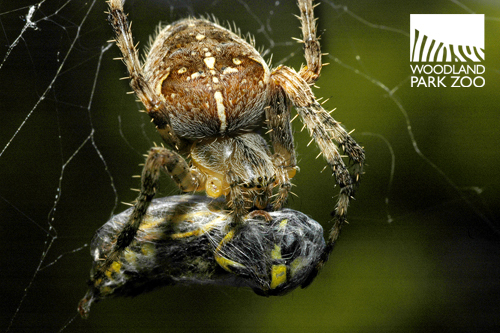 In this awesome photo, an orb weaver has caught a bee and is carefully wrapping it in a gossamer sack. Photo by Ryan Hawk/Woodland Park Zoo. Once the spider gets the signal from its web, it will bite the unlucky target and wrap it in silk. Then the spider waits for the prey to die, vomits digestive fluid over it and… dinner is served! The treat is chewed with the chelicerae (jaws) and the liquefied meat is sucked into its mouth. Mmm, hungry yet? Spiders repeat this manner until all but the inedible hard parts are left. 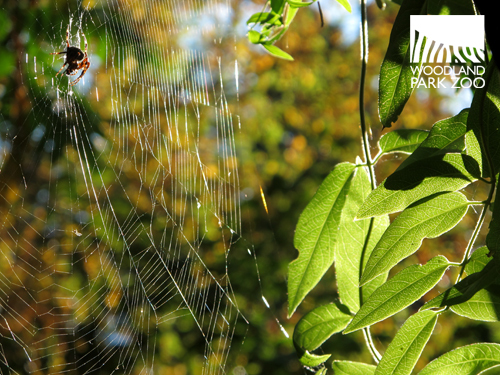 Sunlit webs reveal the intricate structure of the orb weaver’s trap. Photo by Kirsten Pisto/Woodland Park Zoo. Many orb weavers actually rebuild their webs daily. 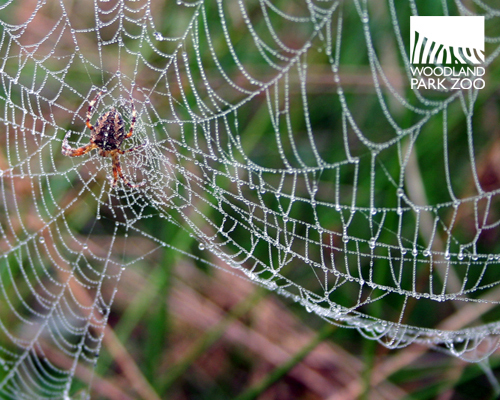 If rain or wind damages the web, the spiders will remodel. At dusk, some orb weavers consume their web to conserve protein. They sleep for a bit, and then rebuild the web at daybreak. This is why web-to-the-face syndrome usually occurs in the morning. This pretty little orb weaver has tucked itself into a flower petal for a nap. Photo by Kirsten Pisto/Woodland Park Zoo. Orb weavers are around all year, but we tend to forget about them until September, when they are large enough to lay eggs and spin larger webs. Most of these spiders will die in the winter, but their new eggs will hatch next spring. The golden silk orb-weaver sits contently on her web in Bug World. Nephila madagascariensis is closely related to the common cross spiders here in the Pacific Northwest. Photo by Dennis Dow/Woodland Park Zoo. 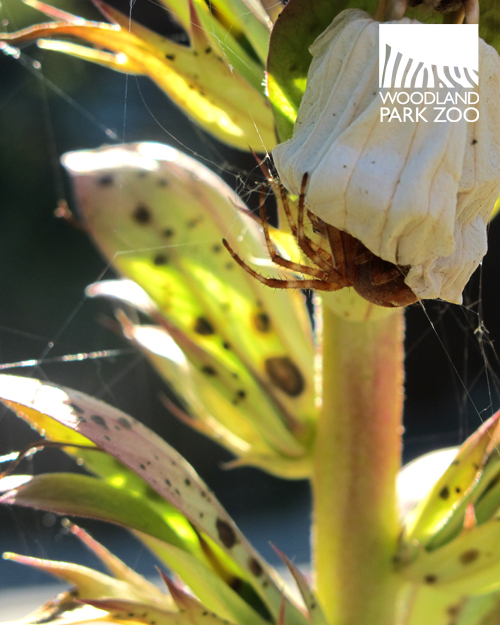 At the zoo, our largest orb weaver is not one stretched across the paths. 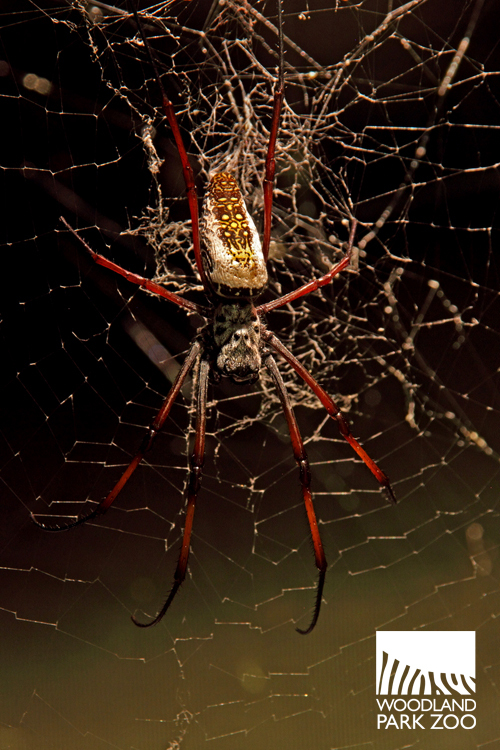 Housed in Bug World, the golden silk orb weaver, Nephila madagascariensis, can grow as big as your hand! Visitors often remark at the windowless exhibit, but don’t worry; she’s happy where she’s at! This web is extremely dangerous and should only be approached by expert spider web wranglers. Photo by Kirsten Pisto/Woodland Park Zoo. 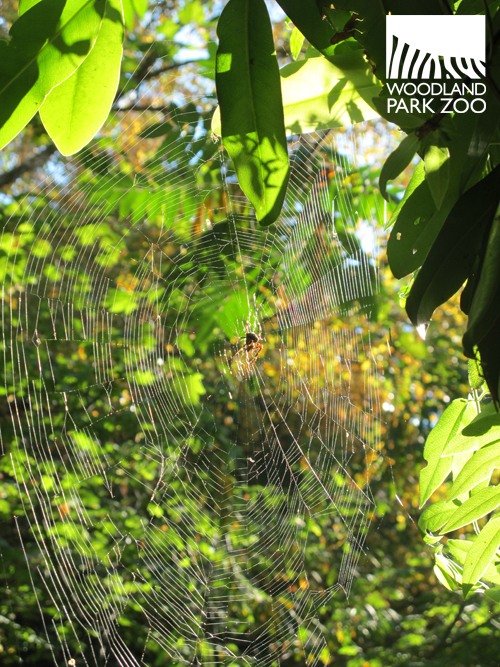 Bring your spidey senses and see how many orb weavers you can spot on your next trip to the zoo… just don’t get too close! Garden spider in Dash Point, WA. Photo by Don Ballantyne. A very clearly explained article on how a female spider builds her web, Kristen! I enjoyed it very much. The pictures and your sense of humor added to my enjoyment. Enjoyed the article & pictures. I've spent hours watching spiders weave their webs. One interesting phenomenon: a spider built her web across my back door, which of course I walked through...after having it destroyed three days in a row, I noticed on morning four that it was now located diagonally in the upper corner of the door, well above the height of my head! And that's where she continued to build it. Pretty smart and adaptive little spider!